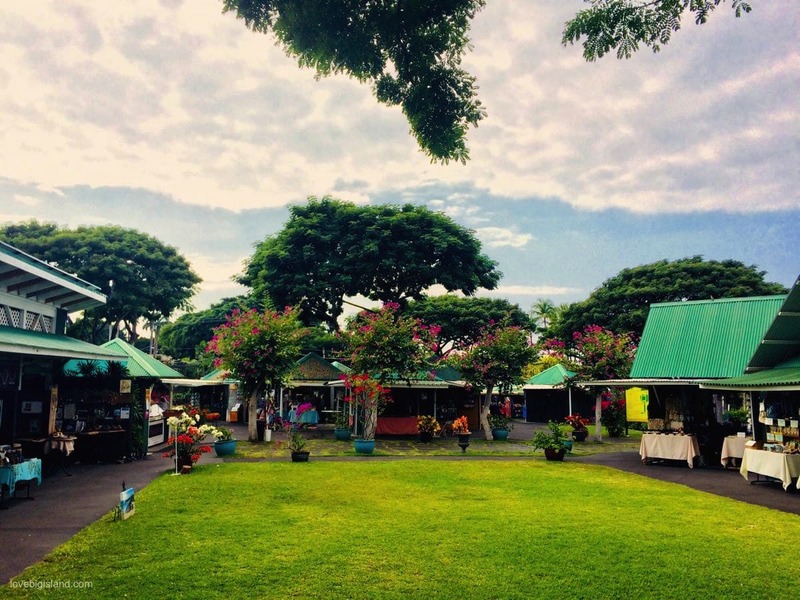 The Ali’i garden market place is not a farmers market but mostly (and as the name suggest) an open air marketplace. There are many stands here selling local arts and crafts (souvenirs! ), as well as some good places for a quick bite. They were voted the “best open-air market place” by the readers of the west Hawaii today in 2001, 2002 and 2003 and at the time of writing they have 25+ unique and local vendors on the market grounds. Prices at the boots are about the same as those in downtown Kona and the local food is good. For example, TJ’s BBQ is the #1 rated restaurant in Kona on TripAdvisor (last checked January 2018, can’t beat the ribs!). Other vendors include Swami’s Dosa Grill (vegetarian/vegan Indian cuisine), Melba’s Vegan & Gluten Free Bakery, Big Island Sweet Treats with Shave Ice, Kettle Corn, Ice Cream and dessert creations., etc. From November to April during whale season, Whale of a Crepe is on site with fresh dessert and savory crepes. The market place is located at 75-6129 Alii Drive, Kailua-Kona. There is plenty of free parking available on the grounds and there is a free “Hop on Hop off bus” (Clark’s) driving between the Kailua pier and the market place every 20 minutes, pick up and drop off from the pier on Wednesdays & all Cruise ship days. Opening hours are between Tuesday and Sunday from 10:00 AM to 5:00 PM. For any questions, please get in touch through (808) 937-8844.